We have had a few days of fantastic sunny weather here in Melbourne and I've started cracking out the sunscreen. I always wear face and neck sunscreen (always always always always), however I've started slapping on the body sunscreen for the extra bits that show too as the sun is getting stronger and I'm wearing less! I thought this would be the perfect opportunity to go through my favorite sunscreens. I generally like my sunscreens to contain the physical sun blocker (inorganic), Zinc Oxide. I won't go into all the nitty gritty on the different between organic and inorganic sunscreens as futurederm has just recently done a wonderful series on comparing chemical and physical sunscreens (find the final part and summary here). It's a great read. For me, the reason I gravitate toward Zinc Oxide is that because it is a physical blocker, it is more stable than chemical sunscreens. So as long as you aren't out in harsh sun and the product is still on your face at the end of the day, it should still be protecting you at the end of the day. I'll start by saying that the reason that these all made my faves list is that they offer good UV protection - I don't stay this pasty by using SPF15. They also all set to a nice matte finish that is dry to touch and work great as a primer to help my T-zone stay matte. 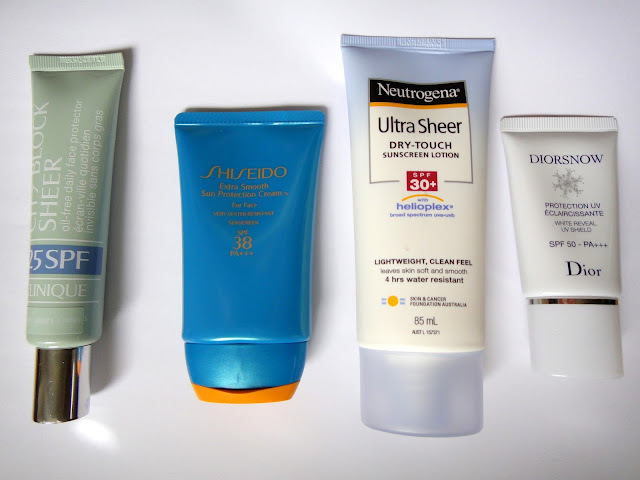 So without further ado, here are my favourite sunscreens. This sunscreen doesn't contain any chemical UV filters. I really like this sunscreen on it's own if I am going makeup-free (or just some mineral powder) as this is the only one with a tint. The only thing that stops me using this every day is that I don't find my liquid foundations sit that well over the top of it and it lends to a powdery kind of finish. The other great thing about this sunscreen is I find it moisturising enough with a hydrating serum underneath so it's quick and easy. This sunscreen is also the only unfragranced one. Probably the best of the bunch for drier skins due to it's moisturising ability. I use this for face. 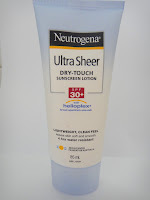 Now I love this sunscreen due to the ultra high SPF, so this is for when I want to pull out the big guns. I don't recommend it for everyday use because it is quite thick and it does leave a notable white cast. I find foundations don't layer that well with this either, similar to the clinique. All these drawbacks are due to the super high Zinc Oxide content, which is it's big bonus too. This also contains a good number of antioxidants including vitamin C, which is great for when you're out in the sun. This one is also the priciest. I use this for face. 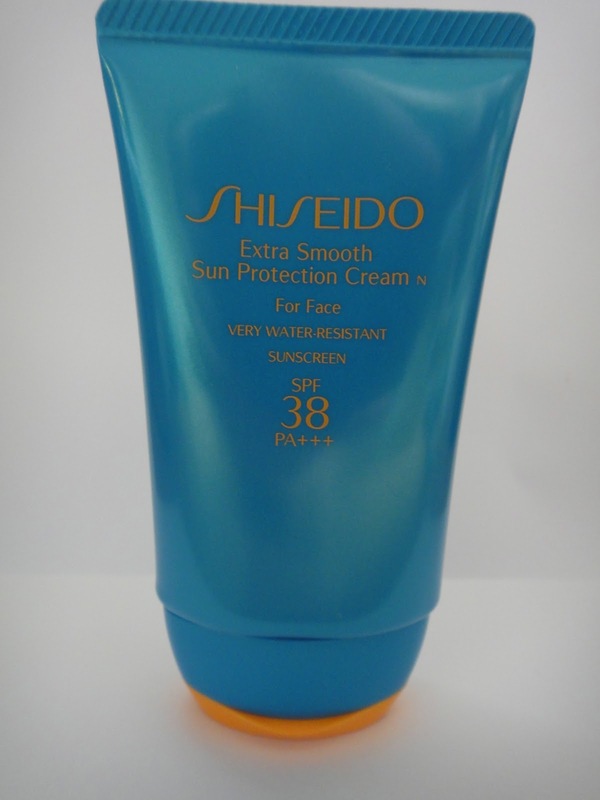 I think this is available at Australian Shiseido counters under the same name but listed as SPF30+. I got mine from strawberrynet. 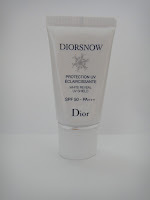 This sunscreen gets the most use due to the fact it's a great all rounder. 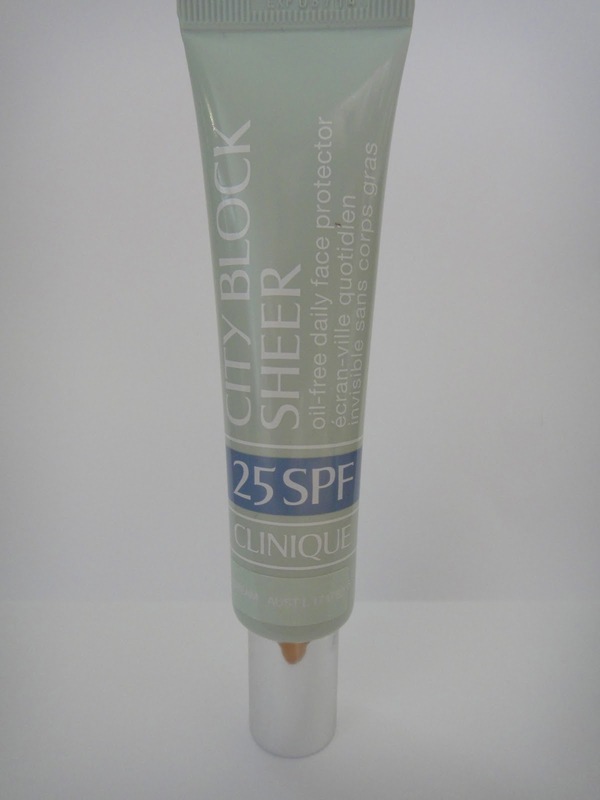 It doesn't leave a white cast, has a really nice smooth texture, is a combination of physical and chemical UV blockers and works well with makeup. The SPF level is one I'm happy with for all year round too. 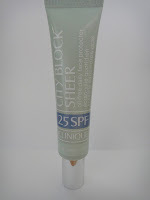 This one has the smoothest finish out of the lot and really evens out my skin's texture. I use this for face. My favourite inexpensive (relative to my other choices at least!) sunscreen. I use this sunscreen as my daily body sunscreen and also for both face and body when exercising. 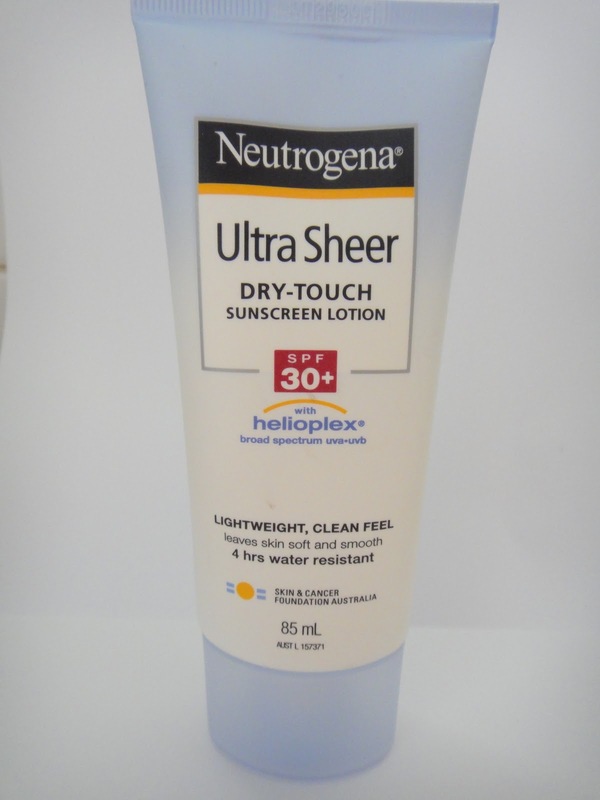 I prefer this sunscreen on my face for exercise because for some reason I'm concerned about Zinc Oxide blocking my pores when I'm sweating profusely and this is a chemical based sunscreen. I don't know if my fear is unfounded or not, but I'm happy with this anyway and it definitely doesn't clog pores. I also don't worry about throwing this in my jersey pocket when I go cycling - no way I'd throw one of my expensive sunscreens back there. 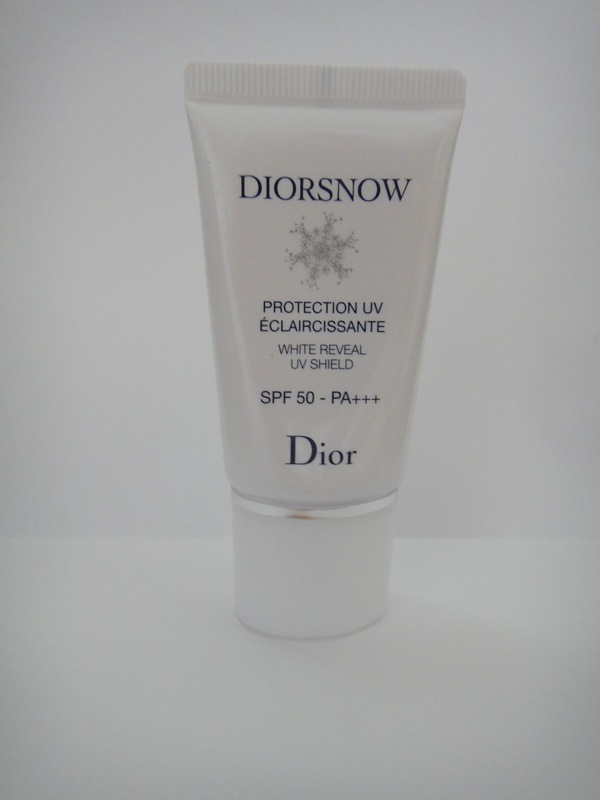 This sunscreen is fabulous, protects your skin for hours and has a great matte, dry touch finish. I've not found another sunscreen from the supermarket/priceline that has as nice a finish as this. I use this for face and body. So which sunscreen would I choose to take with me if I was only allowed one on my desert island? The Shiseido Extra Smooth - it's got the best finish and is so comfortable to wear. Remember you need to apply 1/3-1/2 tsp for full SPF protection for face and neck. I'm always on the lookout for new, good sunscreens. What are your favourites?? Nice!! I am on the hunt for my hg spf moisturiser! I am currently switching between yes to carrots and clean and clear (both spf 15) and I am not fond on either. Might give one of these a try! You can go check out the clinique and shiseido ones at counters to see if you like the texture :) The neutrogena is really great too. The dior I think is a bit harder to get your hands on. 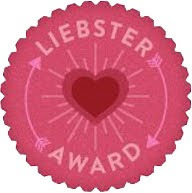 You have a great blog, I know you have already done the post but I tagged you in my liebster blog award post anyway!